Click on image for larger size. As you'll see, the chickens earn their living! It costs about $35/month to keep 11 hens (not to mention the farm mice) well-fed and happy. Evidently, the days of something costing “chicken feed” are gone! The girls go through about two 50-lb bags of layer feed/month. Our happy (spoiled, even) free-range hens supply about $70-80/month of eggs (price of free range, organic eggs at our local grocer is $4.50-5.00/dozen!). 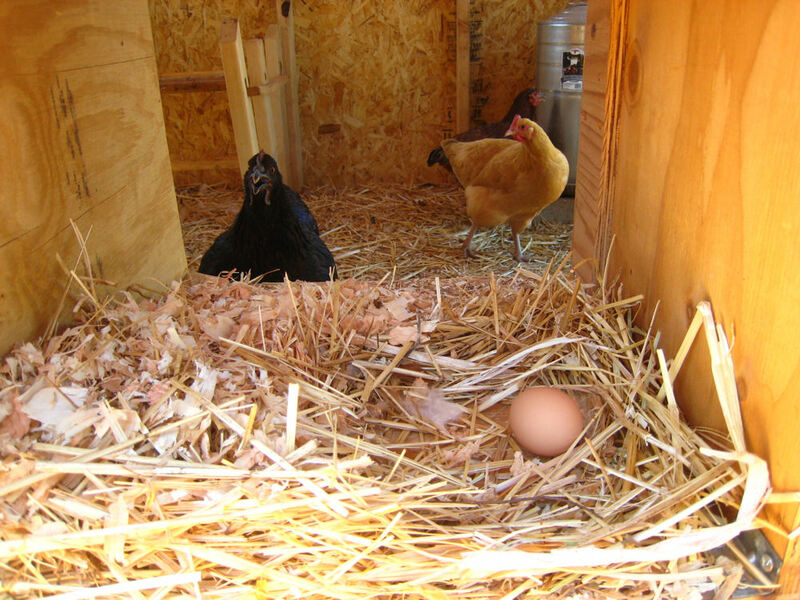 Each hen lays about 5-6 eggs per week in the summer; and about 40% less in the winter. No fear of ‘tainted eggs’ – we’re confident our chooks are healthy and clean. That’s quite a savings! Indignant Shirley and our third egg this past summer. Fencing, building and materials for the chicken coop was >not< cheap. But we wanted to put something up that was not an eyesore (the coop is in the foreground of our backyard view of the distant mountains – why create a Coopenstein? How much exactly? I can’t remember, I was swooning. Ok, ok, somewhere betw. 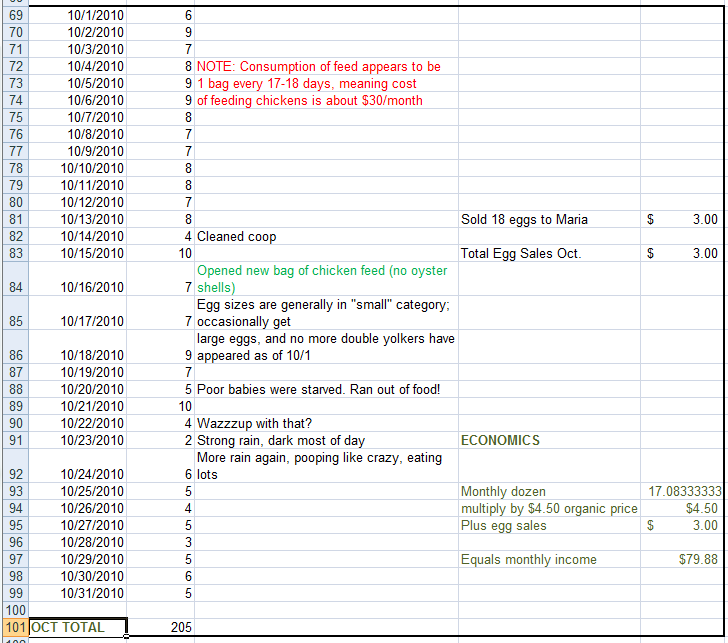 $1-2K for the 16 sqft brooder coop and the 6x8ft (48 sqft) chicken coop with 3 nesting boxes. Yes we could’ve made it cheaper but didn’t, so don’t take our numbers as the benchmark. However, some finished coops are ridiculously expensive, well into the $2K range for the size we built. We do believe that ours is functionally well-designed, but that’s a separate topic we’ll address in another blog. It took about 4 1/2 months until our chickens started producing eggs, so figure spending about $150 on feed prior to their laying. This cost is quickly recouped, as you’ll see in the spreadsheet above. The final word – we do not put a lamp in the coop to extend the hens’ laying season, tricking them into laying the same number of eggs as they do during the longer days of summer. First of all, we don’t consume 9-10 eggs/day nor need to sell them for income. We’re always pleased to be able to get a few dollars for them, and our friends are thrilled knowing their inexpensive, fresh eggs come from super-happy hens! No, not a blog about cars with defects. This is about working with our climate to keep our lemon tree alive in the winter! As is often the case, I want to push the limit as to what I can grow in my microclimate here in Lake County, CA. In this case it is lemons. The summers here are plenty hot, but the winter has too many days when it can dip below freezing. While a mature lemon tree supposedly can handle the winters here, the young ones cannot. Lemon trees that are between 1-2ft tall are reasonably-priced. I got an Improved Meyer Lemon tree at the end of summer for $25 plus a 30% discount because the nursery was clearing out inventory. A lemon tree that is big and hardy enough to handle the winters in its first year has to be delivered by truck, and can be $100-200 depending on how large you want it. My answer was to get a small lemon tree and make it mobile. Pictured here is the lemon tree with a dolly that I got when we moved from the coast this year. In the winter I will move it in and out of the garage when the temps fall to the mid to low 30s (F) and below. Incidentally, make sure you select a dolly that can handle the weight of your potted tree/plant. Some are relatively inexpensive ($10 or less), but these have small wheels and cannot handle a lot of weight. Our lemon tree is quite heavy, so the hand truck/dolly that we used for moving was perfect because it has large wheels and the right weight capacity. How well will this system work? Well either I will be writing a success story follow-up to this article or crying in the next few months. When writing Plangarden blogs, I want to document successes as well as failures. I leave the perfect garden stories to the TV shows where nothing really ‘goes wrong’.